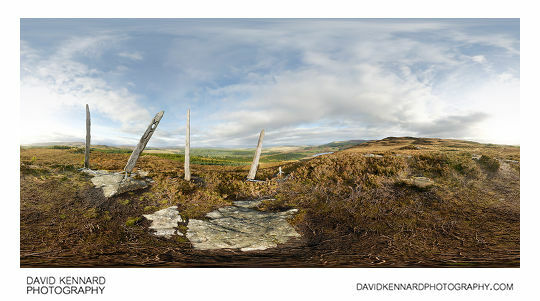 I just finished processing a few panos from my Scotland holiday in Autumn 2011, and Japan holiday in Autumn 2009. This one is from Holyrood Park in Edinburgh. 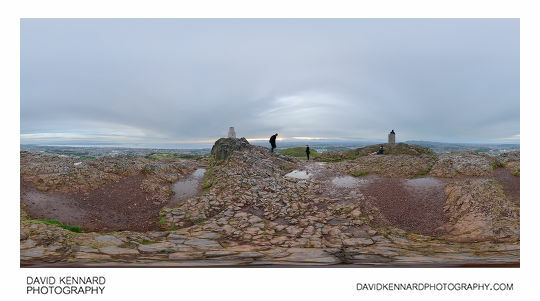 The park contains an extinct volcano, and this panorama was taken at the peak, which is known as "Arthur's Seat". I was hoping to take some nice sunrise panoramas, but as you can see, the sky was unfortunately dull and overcast. I looked over the western edge of the hill, and it looked almost vertical. But then a bit later a dog popped up there. Then a few seconds later a jogger popped his head up! There seemed to be a few tracks in Holyrood park that were going up extremely steep bits of hill. 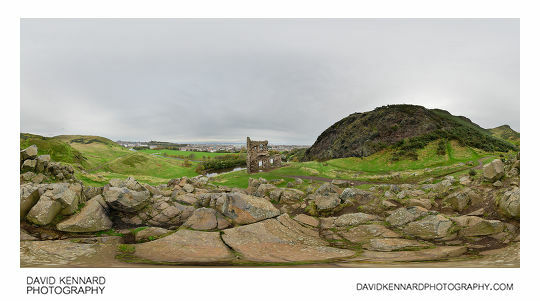 Another one from Holyrood Park, this one is from a pile of rock near St. Anthony's Chapel. It is not known when the chapel was built, the first record of the chapel is in 1426. The last chaplain was recorded in 1581, today there are only two walls of the chapel left. This one above is from the Abriachan Forest, near Loch Ness. The wooden posts are a modern sculpture. The forest is owned by the local community and they have done a great job of making some nice trails for walking. Hakone, in Japan, is a popular tourist area, with mountains and hot spas, and not too far from Tokyo. When we visited, there were giant queues for the cable car. So we decided to walk across the mountain instead. 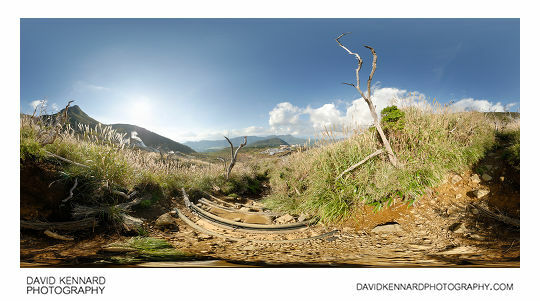 The pano above was taken on the mountain path. As far as I can find, the part of mountain we climbed up doesn't have a name. 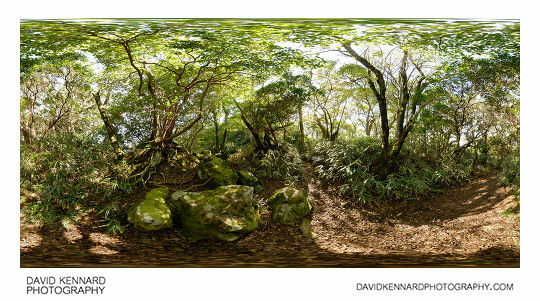 You can carry on along the path to get to Kamiyama, which is the highest peak in Hakone. But we turned off at a branch of the path instead. This is the path going back down the other side of the mountain. You can see the peak of Kamiyama on the left of the image. There are a number of dead trees along the path, which I think is due to sulphur fumes blowing up from the valley below. The trees obviously grew to a reasonable height before dying, and the grass around looks quite healthy. So I would guess there was a large or extended eruption of sulphur fumes at one point that killed the trees, and then subsided. 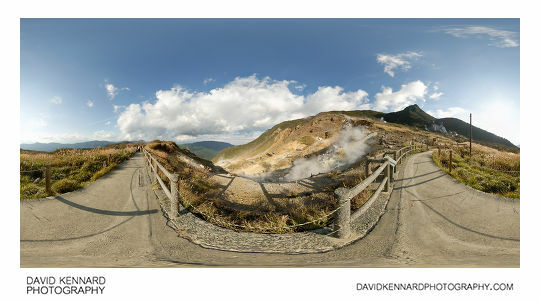 And this pano is looking down into the valley, which is called Ōwakudani ("Great Boiling Valley"). You can see the ground in the valley is bare soil and rock, with no plant life thanks to the fumes. It wasn't too smelly though. Apparently they make special eggs here, boiled in the hot springs. The egg shell turns black, and the eggs have a slight sulphur flavour. Eating one is meant to increase your life by seven years.